I have been watching the Showtime documentary “The Spymasters: CIA in the Crosshairs,” in which all 12 living CIA directors and others operatives are interviewed. I was struck by the brief segment below in which George W. Bush’s briefer on September 11, 2001, admits that the Bush administration did not keep the country safe. The documentary also illustrates how President Bush was warned by the CIA in the strongest terms that an attack was coming. 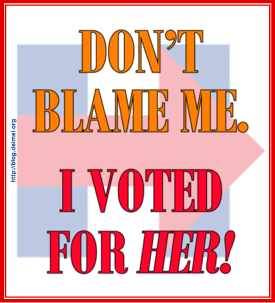 The administration essentially did nothing. Fresh Air ran an excellent segment on “The Spymasters.” You can find it here. Republican presidential candidate Jeb Bush has continued to insist that his brother kept the country safe. Draw your own conclusions. I wrote the letter below to the new presiding bishop last month out of concern for what might happen at the Primates’ Meeting in January. When I first heard that the Archbishop of Canterbury had called the meeting, my anxiety spiked. Would the meeting result in a looser, more irenic Communion, or would it re-ignite long-simmering conflicts? Would the meeting, in fact, begin the dismantling of the Communion? The Anglican Covenent has widely been considered at a dead end. Unfortunately, no one in authority has acknowledged its failure, and zombie-like, the ill-conceived pact repeatedly seems to rise from the dead. I decided to publish this letter after reading a post by Mark Harris responding to a rather incoherent essay from The Living Church promoting “Primatial option for the Covenant,” whatever that is, at next month’s gathering. Clearly, the Covenant still has its die-hard supporters. It is time for The Episcopal Church to stand up for itself and reject the bullying of Global South primates. Presiding Bishop Michael Curry is about to undergo an early trial by fire. I pray that he is keenly aware that, in large measure, he will not be among friends. Greetings from the Episcopal Diocese of Pittsburgh, a diocese that has suffered the depredations of schismatic Episcopalians and their allies in the wider Anglican Communion, particularly in the Global South. I am writing out of concern for the possible outcome of the January Primates’ Meeting called by the Archbishop of Canterbury. I write as someone who labored to thwart the ambitions of Bishop Robert Duncan—I was the first president of Progressive Episcopalians of Pittsburgh—and as the founder of the No Anglican Covenant Coalition, which has worked to prevent attempts to impose a uniform “orthodoxy” throughout the Anglican Communion. I cannot speak for all Episcopalians, but I do speak for many who love The Episcopal Church yet have seen it assaulted both from within and without for taking stands of which we believe Jesus would approve. I have no doubt that you will defend our church against those who would transform it into yet another intolerant and self-righteous Protestant denomination, but I urge you to be more conspicuous in your defense of The Episcopal Church, if not more resolute, than your two predecessors. In particular, I ask you to dissociate yourself and our church publicly from any communiqué emerging from the meeting if you disagree with its contents. You are, after all, a representative of The Episcopal Church, not of the Anglican primates. The Primates’ Meeting is not—must not be—the board of directors of the Anglican Communion. The genius of Anglicanism is in part its willingness to depart from received tradition in order to minister meaningfully to God’s people in particular places. If that is unacceptable to a majority of the primates, it is the Communion (or our relation to it), not The Episcopal Church, that must change. If militant traditionalists are determined to remake the Communion in their image, we must disengage from it, both operationally and financially. We can continue to pursue common ministry with those Anglican churches willing to tolerate our differences. Know that you will be in my prayers in the coming days. I hope that you can help to ameliorate the current dysfunction of the Anglican Communion. If that goal is unattainable, we should reaffirm our right, willingness, and need to follow what we believe is the path demanded by our Lord and Savior. Update, 2/3/2016. I received a letter from Presiding Bishop Michael Curry a couple of days ago. It provided no insight into his thinking in the aftermath of the meeting of the primates beyond that which I already had from his public statements. I was pleased to receive a response to my letter, however. Not every bishop to whom I have written has been polite enough to reply. How Important Is the Diocese? Bob Duncan, the bishop of ACNA’s Anglican Diocese of Pittsburgh, recently sent out a fund-raising letter. (A PDF version of the letter is here.) 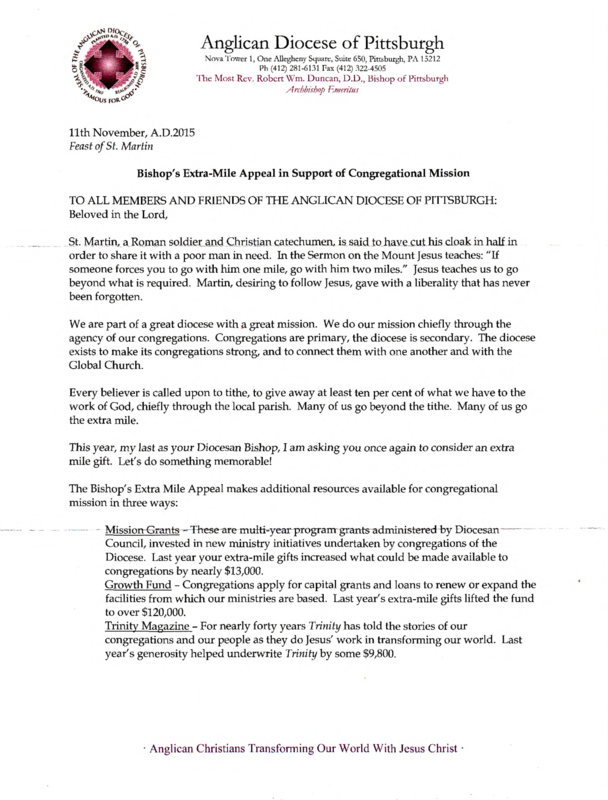 The appeal carried the title “Bishop’s Extra-Mile Appeal in Support of Congregational Mission.” The appeal suggests, as have other indicators, that the Anglican Diocese of Pittsburgh continues to be under-funded. Every believer is called upon to tithe, to give away at least ten per cent of what we have to the work of God, chiefly through the local parish. Many of us go beyond the tithe. Many of us go the extra mile. This year, my last as your Diocesan Bishop, I am asking you once again to consider an extra mile gift. Let's do something memorable! We are part of a great diocese with a great mission. We do our mission chiefly through the agency of our congregations. Congregations are primary, the diocese is secondary. The diocese exists to make its congregations strong, and to connect them with one another and with the Global Church. The militant traditionalists of (or recently of) The Episcopal Church have played fast and loose regarding the importance of dioceses. When then bishop Duncan was urging the churches of the diocese to vote to leave The Episcopal Church, he repeatedly asserted that nothing would change; congregations would merely dissociate themselves from the heretical wider church. To reassure them—disingenuously, I might add—that they would be able to keep their property, he told the people that the diocese, detached from The Episcopal Church, would make no claim on their property such as that asserted by the Dennis Canon. On the other hand, conservative bishops had earlier latched on to the notion promoted by former Archbishop of Canterbury Rowan Williams that the diocese is the fundamental unit of the church. James F. Turrell called this notion dangerous, idiosyncratic, and profoundly ahistorical. The archbishop seemed to be looking for buy-in for the Anglican Covenant wherever he could find it—why not from dioceses if The Episcopal Church would not accept it?—but the effect went beyond what was intended. Some bishops did talk of having dioceses adopt the Covenant, but Williams’ ill-considered ideas also provided justification for dioceses leaving The Episcopal Church. The reality, I’m afraid, is that Duncan and his ilk will make whatever argument serves their purposes. When a strong diocese advances their cause, the diocese will be emphasized. When congregational autonomy does so, diocesan leaders become congregationalists.